Gulf of Gabés on the eastern coast of Tunisia was formerly known as Syrtis Minor. Today is contains the Tunisian oil reserves and has the distinction of having one of the few significant tidal ranges (max. 8 feet) in the Mediterranean, which exposes extensive sandbanks at low tides(b). Inland from the Gulf are the salt marshes or chotts that originally constituted an inland sea, possibly Lake Tritonis, connected with the Mediterranean but due to a seismic upheaval a ridge was created separating them from the outer sea. A comparable event was the 2011 Fukushima earthquake which moved the seafloor 16 meters vertically and 50 metres laterally(a). In the 19th century François Roudaire proposed the cutting of a channel from the Gulf of Gabés to the chotts, recreating the former inland sea(c). 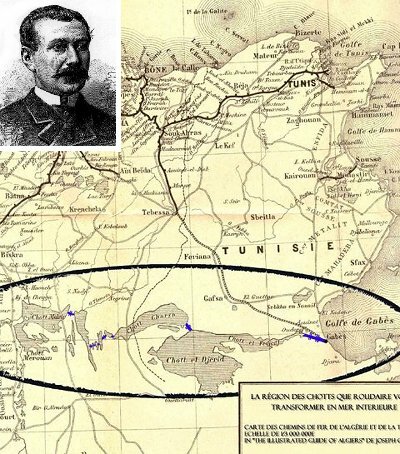 His plan was supported by Ferdinand de Lesseps (1805-1894), who developed the Suez Canal. However, when Roudaire surveyed the chott nearest the sea, Chott el-Djerid, he discovered that it was in fact lying significantly above sea level. This forced him to revise the scale of the plan, which in turn began the erosion of support for the project, which was eventually abandoned. It is interesting that the idea of creating a vast inland sea in the Sahara has been been raised again(d) in the context of the current climate change, which, if unchecked, will raise sea levels dramatically. The objective of this new inland sea would be to partly offset this sea level rise. Férréol Butavand was one of the first to locate Atlantis in the Gulf of Gabés. In 1929 Dr. Paul Borchardt, the German geographer, claimed to have located Atlantis between the chotts and the Gulf. Dr. Anton Mifsud has drawn attention to the writings of the Greek author, Palefatus of Paros, who stated (cap. 32) that the Columns of Heracles were located close to the island of Kerkenna at the western end of Syrtis Minor. Alberto Arecchi has built on the earlier work of Butavand and places Atlantis firmly in the Gulf(e) when sea levels were much lower as a result of an isthmus separating Eastern from Western Mediterranean. George Sarantitis delivered three papers to the 2008 Atlantis Conference also locating the Pillars of Heracles in the Gulf of Gabés, which led to the ‘Atlantic Sea in modern Tunisia and Algeria, south of the Atlas Mountains and the site of Atlantis.